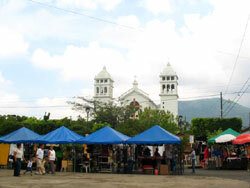 "The Flowers Trail" takes you to some of the most charming towns and cities in northwestern El Salvador. 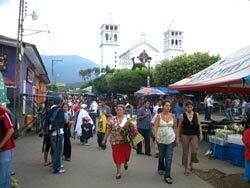 Juayua is one of them at 16 km North West of Sonsonate and at 1040 m above sea level. 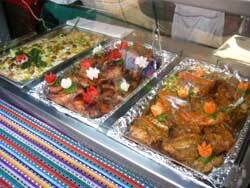 Juayua is most known for its gastronomical festivals each weekend. Its patron saint festivities which honor the Black Christ are also very famous, January 8 - 15th. 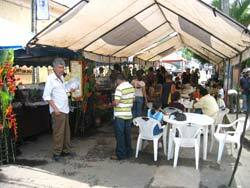 One of the touristic attractions nearby is the coffee mills where you can watch the whole process of coffee production. In 1577 the town belonged to the Seráfico convent of Sonsonate, a little time later it formed part of the province of los Izalcos, and finally on February 13th 1877 it was declared Villa and got the name of El Progreso (progress) due to its agricultural richness and improvements. 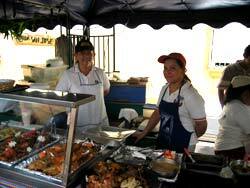 Juayua also became very powerful because of the coffee commerce, eventhough it was never consumed by its inhabitants. The city changed its name once again to its current one, when it became a city in 1906. Many indigenous people lost their properties to the abolition of communitarian land in 1881, which in the long run led to their uprising and creation of the revolutionary movement in 1932, when Juayua became a headquarters cuartel; one of the most important movements in Central America and one where thousands of indigenous people died, not only in Juayua but all over El Salvador (David Browniing). 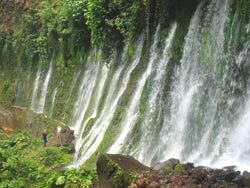 Near Juayua there are some fantastic waterfalls. 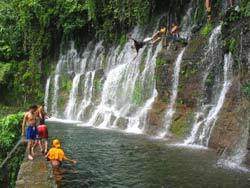 In fact there are four different waterfalls, which you can explore one after the other. From Juayua you can walk in about 30 minutes into the waterfalls.